New Price!Beautiful 4 bedroom, 4 bathroom home with a main floor master in the award winning golf course community of Red Hawk! Upon entering you will enjoy wood floors, 2 story entry and gorgeous open railed staircase. There is a office with attractive french doors and a formal dining/flex room. The gourmet kitchen features double ovens, microwave, hardwood floors, island, tons of cabinets/counter space & pantry! The kitchen is open to the family room with a cozy fireplace, oversized mantle and large windows. On the main floor, you will also find a wonderful master suite with an expanded 5 piece master bath. Upstairs is complete with 3 spacious secondary bedrooms and 2 full bathrooms, one of which is an en suite. Big & functional loft is also included in this wonderful floor plan. The back yard is flat with mature landscaping and has a newer trex like deck. Massive unfinished basement. LOW TAXES! 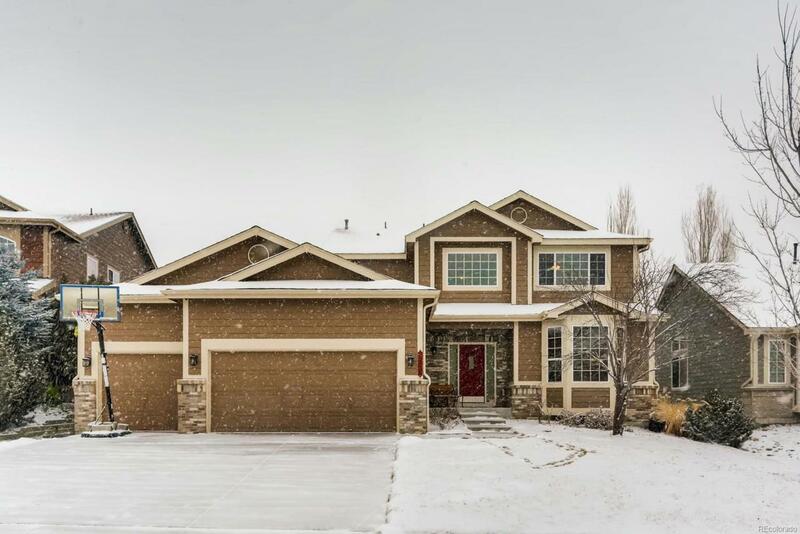 Easy access to I-25 and close to schools, shopping and The MAC (Phillip S Miller Park).